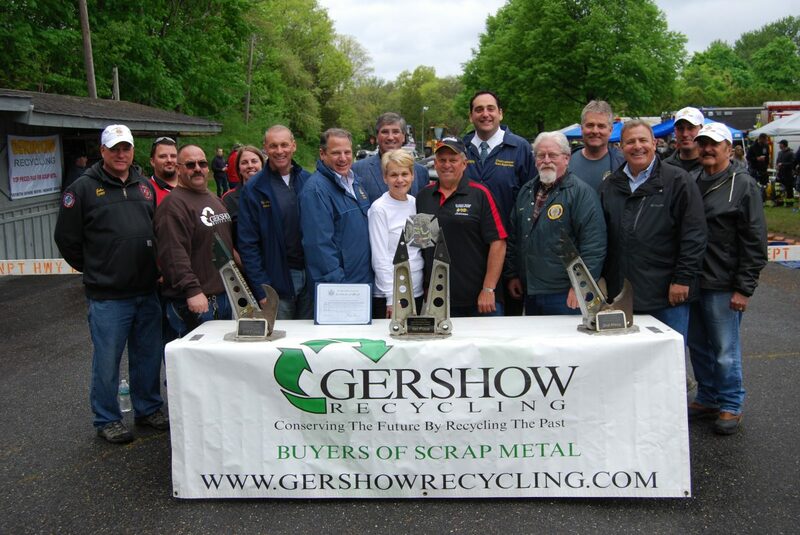 Representatives of Gershow Recycling joined members of the Northport Fire Department and local elected officials at the Eleventh Annual Chuck Varese Vehicle Extrication Tournament at Steer’s Pit in Northport on May 12. Pictured (front row, left to right): John Jacobsen, Chief, Northport Fire Department; Rich D’Angelo, Manager, Gershow Recycling Corp.’s Huntington facility; Steve Stern and Andrew Raia, New York State Assemblymen; Jeanne Varese, Emergency Medical Technician, Northport Fire Department and Co-Coordinator, Chuck Varese Vehicle Extrication Tournament; Robert “Beefy” Varese, Ex-Chief, Northport Fire Department and Coordinator, Eleventh Annual Chuck Varese Vehicle Extrication Tournament; Damon McMullen, Mayor, Village of Northport; Steve Rossetti, Vice President of Special Projects, Gershow Recycling; and Dennis Sheridan, First Assistant Chief, Northport Fire Department. Back row (left to right): Will Varese, Ex-Captain, Northport Fire Department Hook & Ladder Company; Jenny Varese, Will’s wife; Kevin Gershowitz, President, Gershow Recycling; Chad Lupinacci, Supervisor, Town of Huntington; Ian Milligan, Trustee, Village of Northport; and Doug Pyne, Second Assistant Chief, Northport Fire Department. In support of local fire departments, Gershow Recycling donated the use of 30 cars for the Eleventh Annual Chuck Varese Vehicle Extrication Tournament, which was held at the Northport Fire Department’s Training Grounds at Steer’s Pit in Northport on May 12. Gershow also donated the use of its Huntington facility to enable teams to practice in the week leading up to the tournament. Nineteen teams from eleven fire departments participated in the tournament, which involved groups of five firefighters working to extricate a “victim” from a “crash” using the Jaws of Life. Each team was judged on the amount of time it took to perform the extrication, the handling of equipment and the safety procedures they followed. After the tournament, the vehicles were brought back to Gershow’s facility, where they were shredded and recycled.